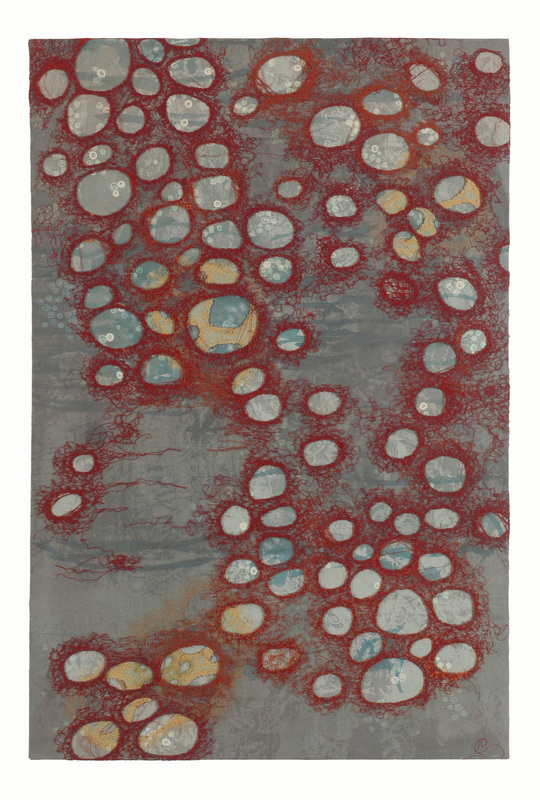 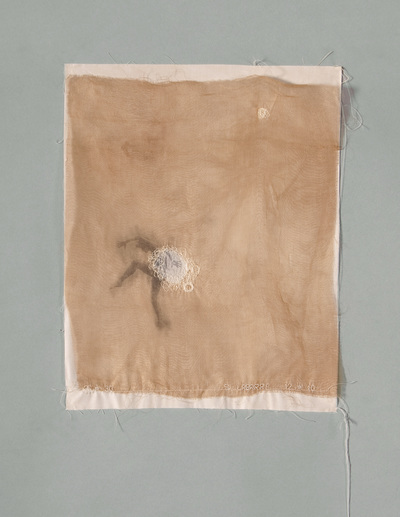 In my installation Acts of Emergence, impressions of memory and past experiences emerge from canvas through layers of stain and stitch. 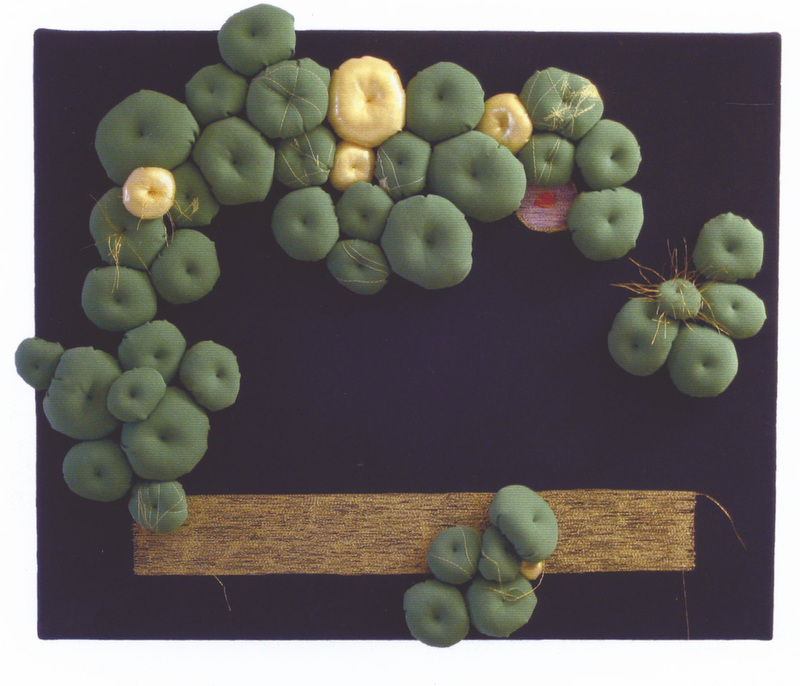 Each piece suggests a fragment of memory—real and imagined. 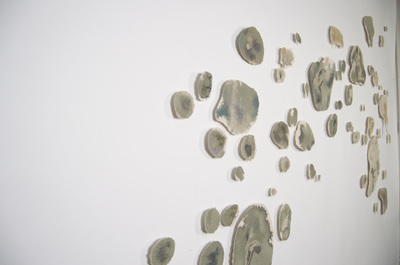 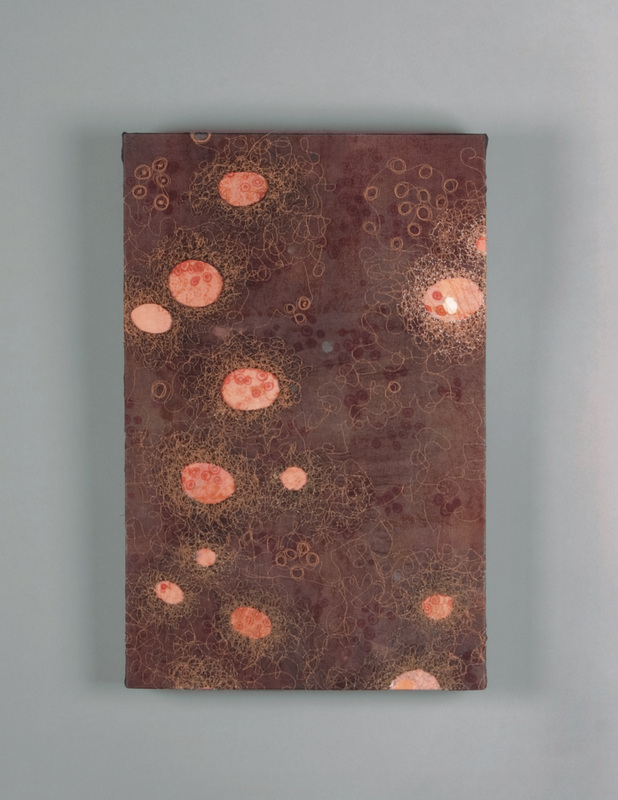 Several dozen fragmented units represent a mapping of memory through space, as if each component manifests pieces of a moment in time, flowing across the wall. The format of this piece presents a kind of disjointed timeline that contains partial records of an experience. 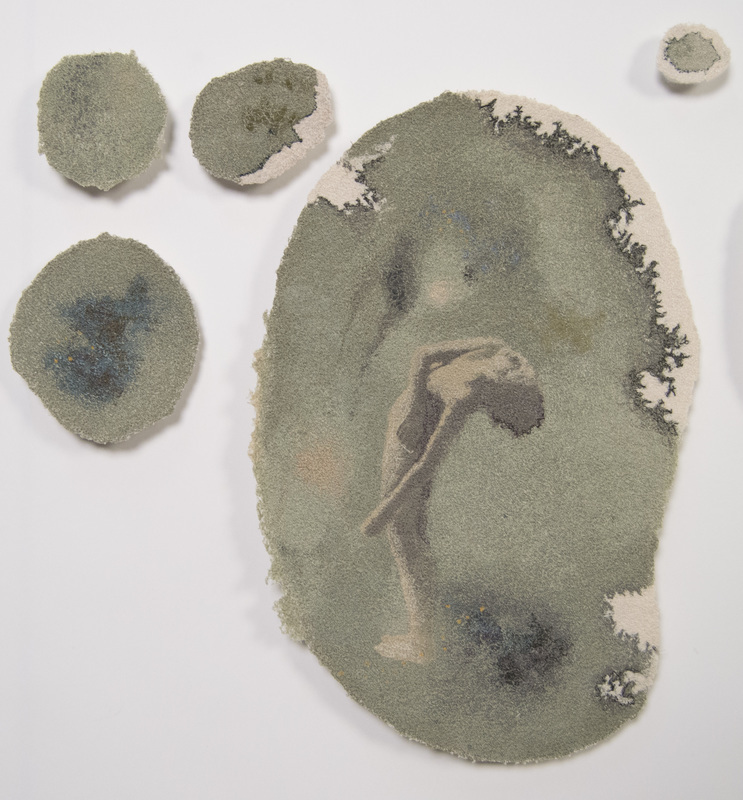 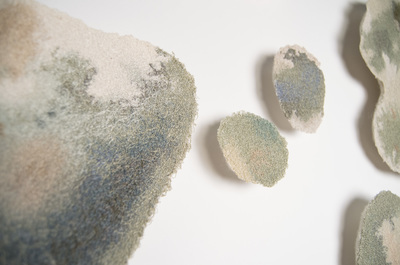 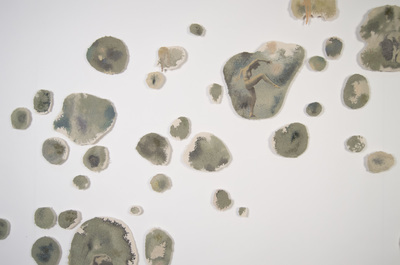 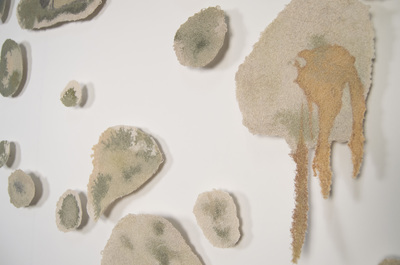 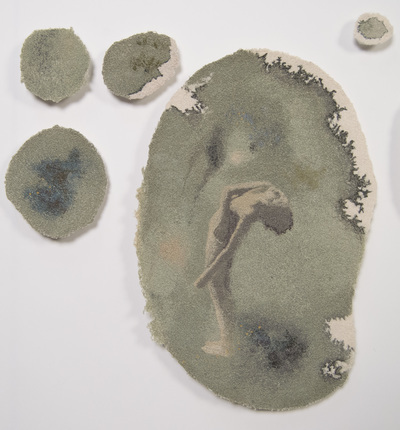 The work as a whole is scattered across and floating away from the wall, creating a fragmented composition made up of bits of densely stitched canvas. 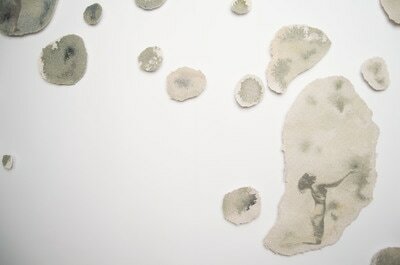 Viewed more closely, each fragment itself becomes a composition. Stains suggest the presence of memories left behind. 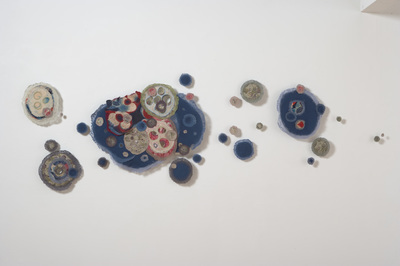 Each piece in this panorama holds a moment; together the units present a kind of suspended place or moment in time. 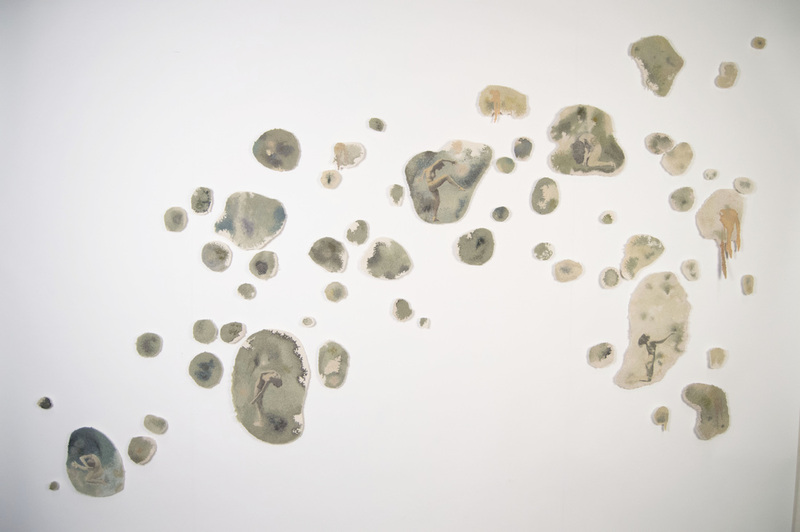 These fragments appear to travel across the wall, emerging from my memory and stained with references to a history, not unlike paintings made by the Mexica people of Pre-Hispanic Mexico, who conceived time and space as intrinsically linked. 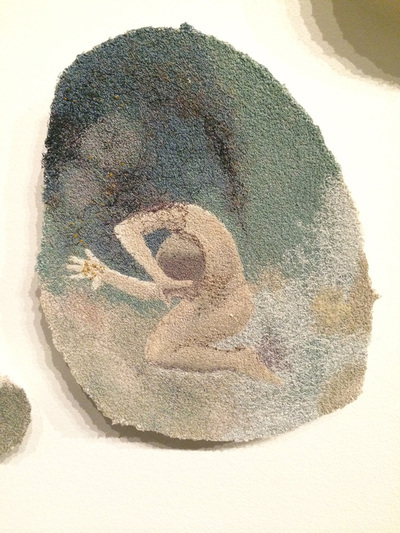 I draw much inspiration from the human body’s capacity to convey many emotions. The dancing figures in my work are anonymous: each with their own identity, yet not seen as anyone in particular. 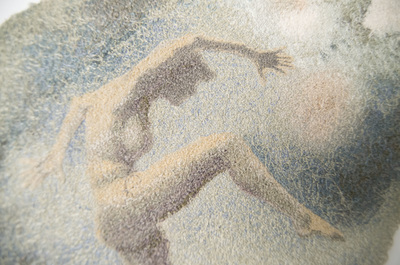 They are frozen in specific moments, offering a view of that moment as well. Together, suspended figures plot multiple moments within this spreading map of memory. 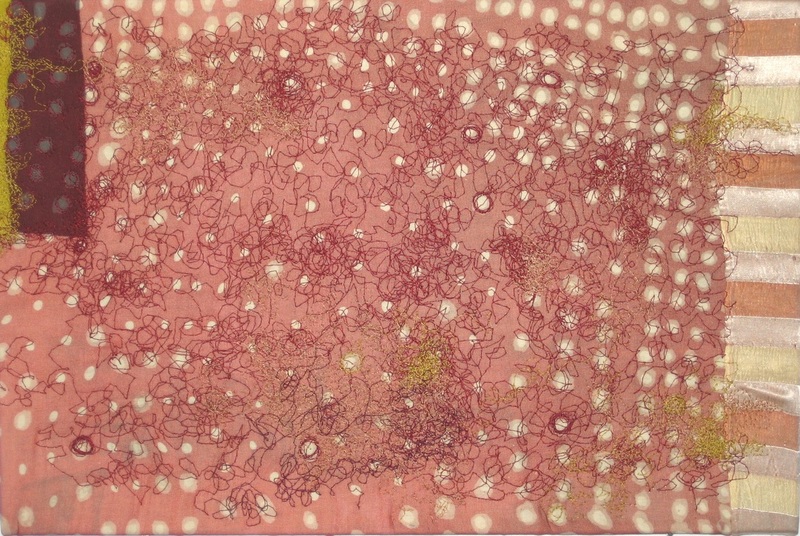 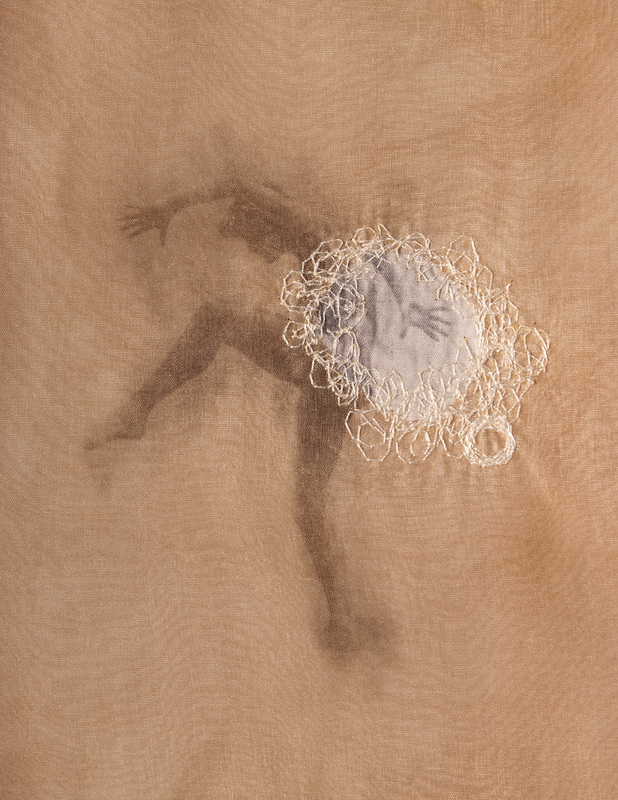 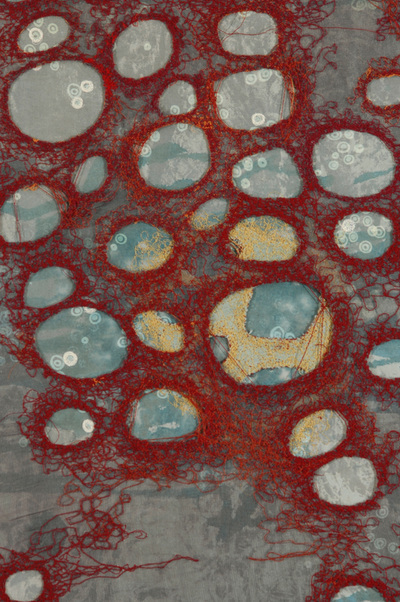 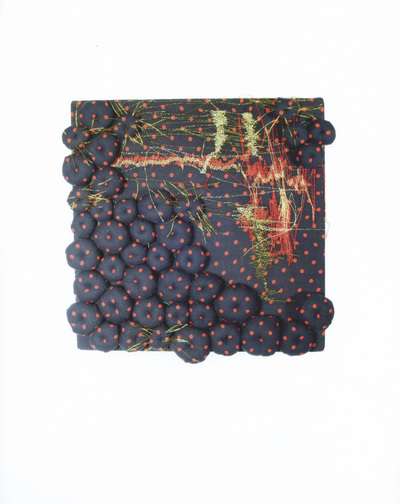 Acts of Emergence, 2015, machine embroidery on hand-painted canvas. 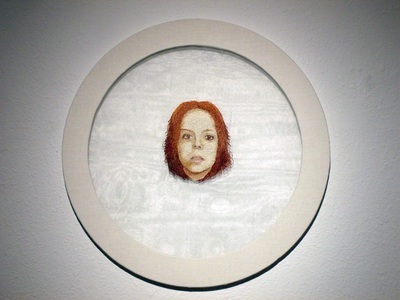 Selfish I 2013 18" x 18" Hand-embroidered on silk. Selfish II 2013 18" x 18" Hand-embroidered on silk. Selfish III 2013 18" x 18" Hand-embroidered on silk. 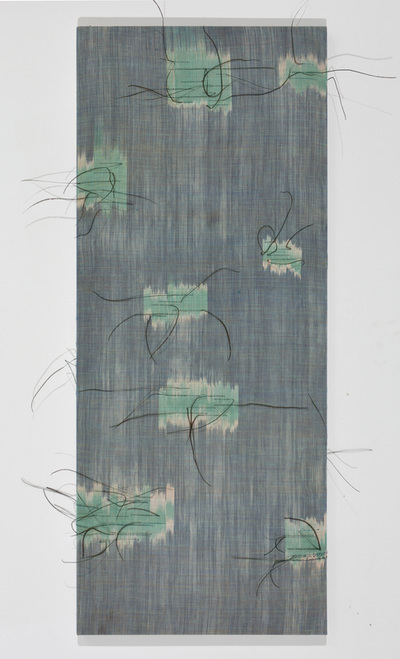 Selfish IV 2013 18" x 18" Hand-embroidered on silk. 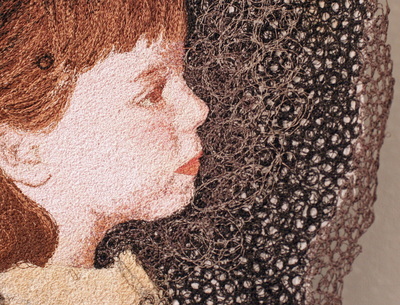 She Decided Against It 2011 20" x 48" Machine-embroidered on silk. 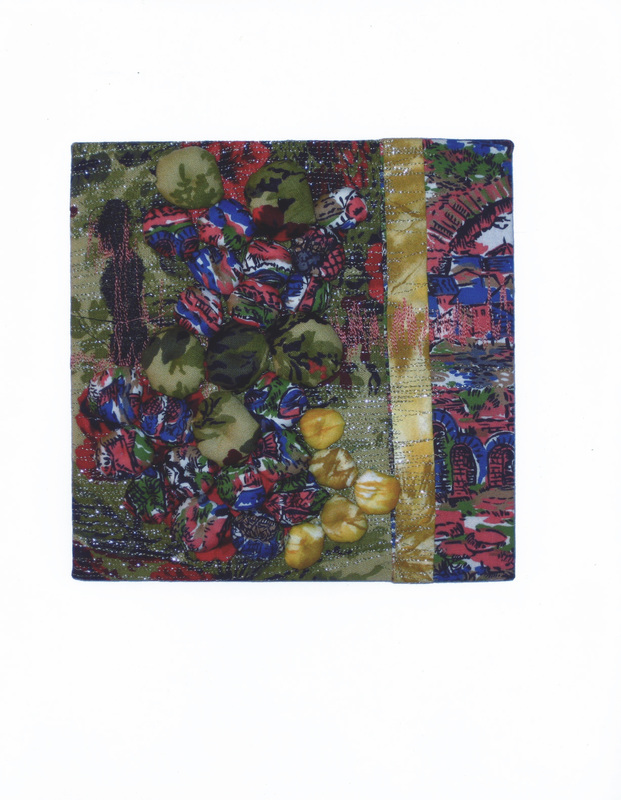 Linked 25/30 2011 12" x 9" Photo transfer, machine embroidery. 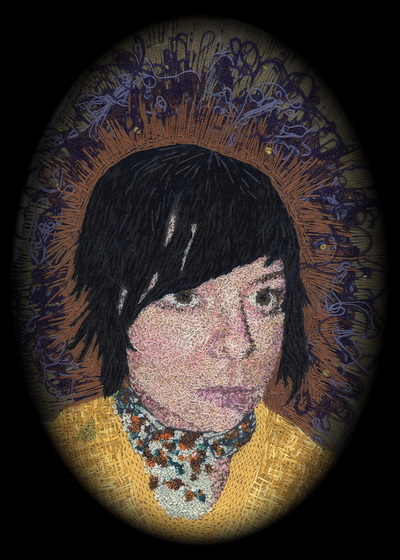 She, Before 2011 28" x 20" Machine-embroidered on silk. Self Portrait 5yrs 2008 14" x 11" Hand and machine-embroidered on silk. 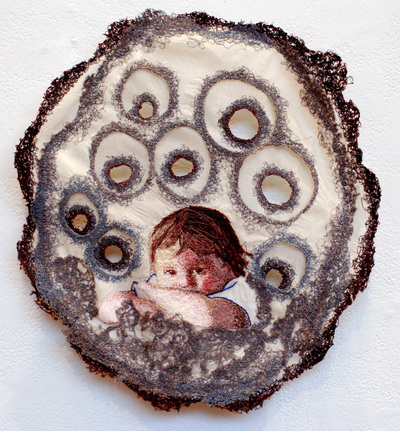 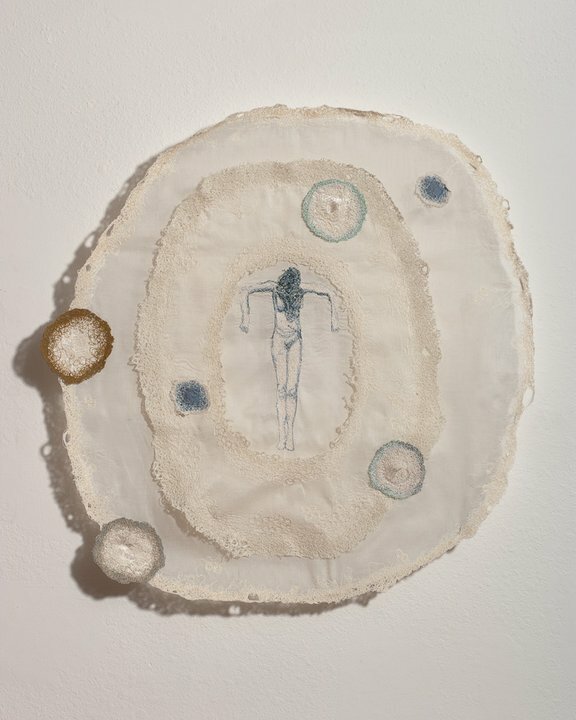 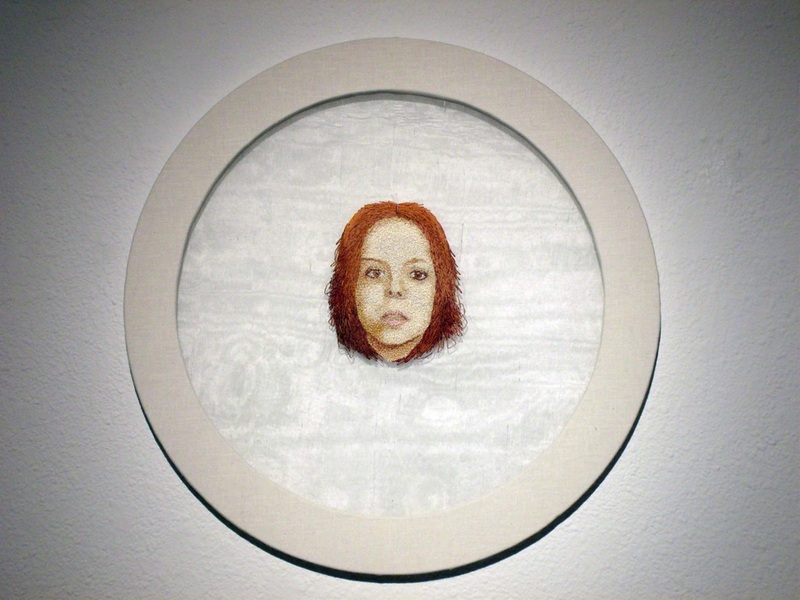 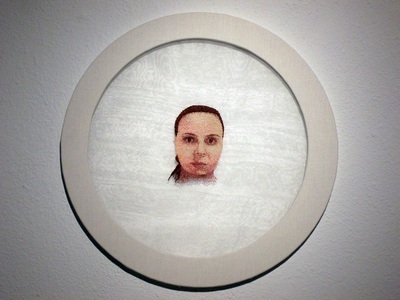 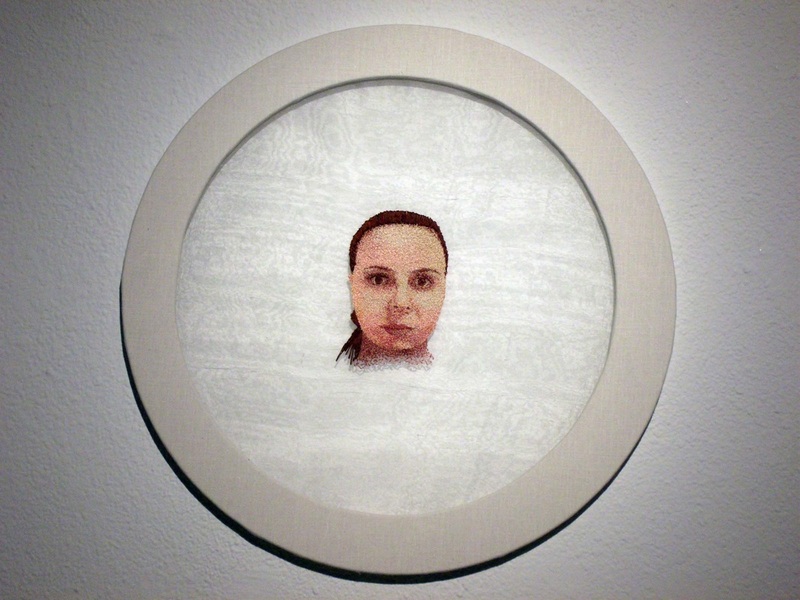 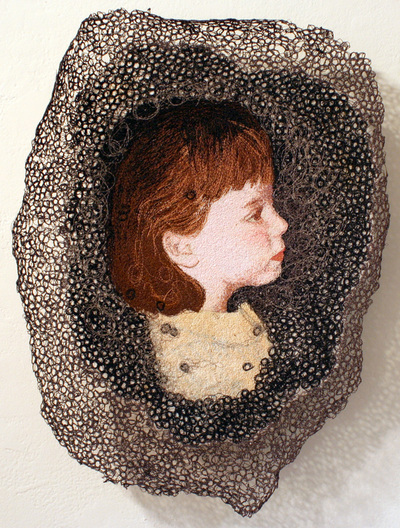 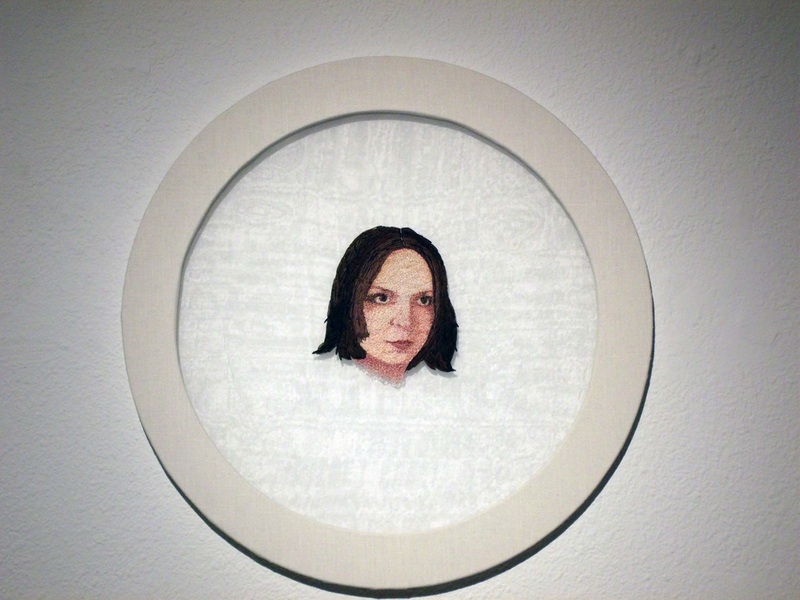 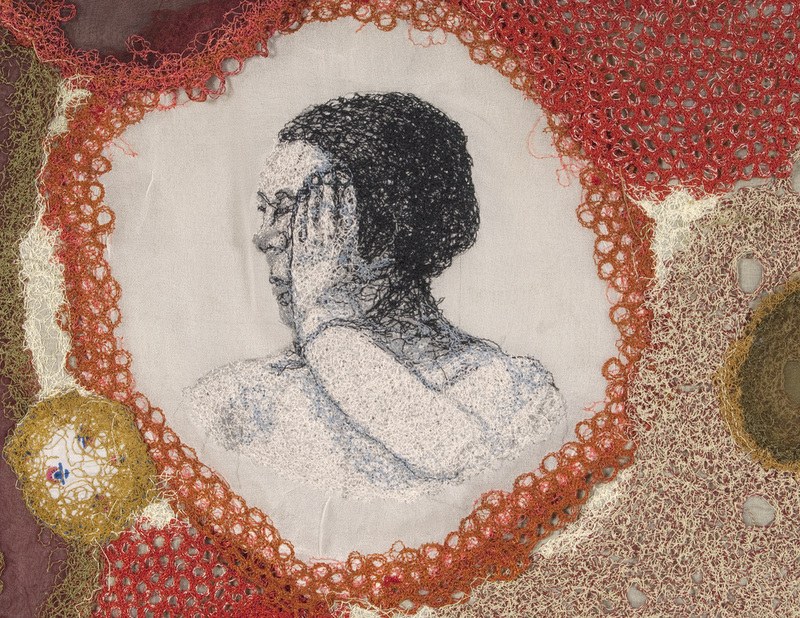 Self Portrait (Mother's Circles) 2008 18" x 15" Hand and machine-embroidered on silk. 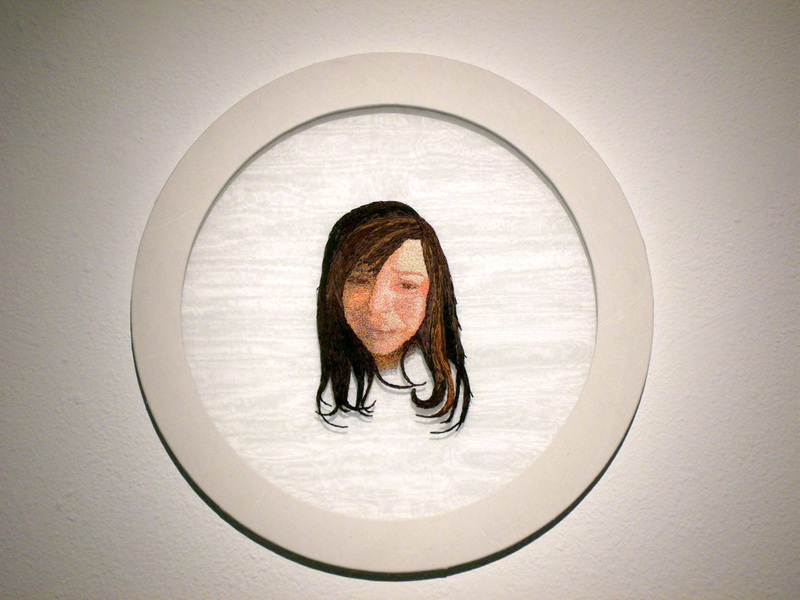 Darning Again 2007 36" x 24" Machine-embroidered on cotton. 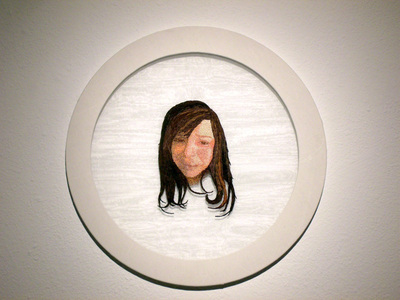 Darning for You 2008 18" x 12" Machine-embroidered on cotton. What Came Before Grew 2008 3' x 10' Cotton, 19th c. Uzbeki textiles, machine embroidery. 1923 Montegut 2008 12" x 12" Found fabric, machine embroidery. 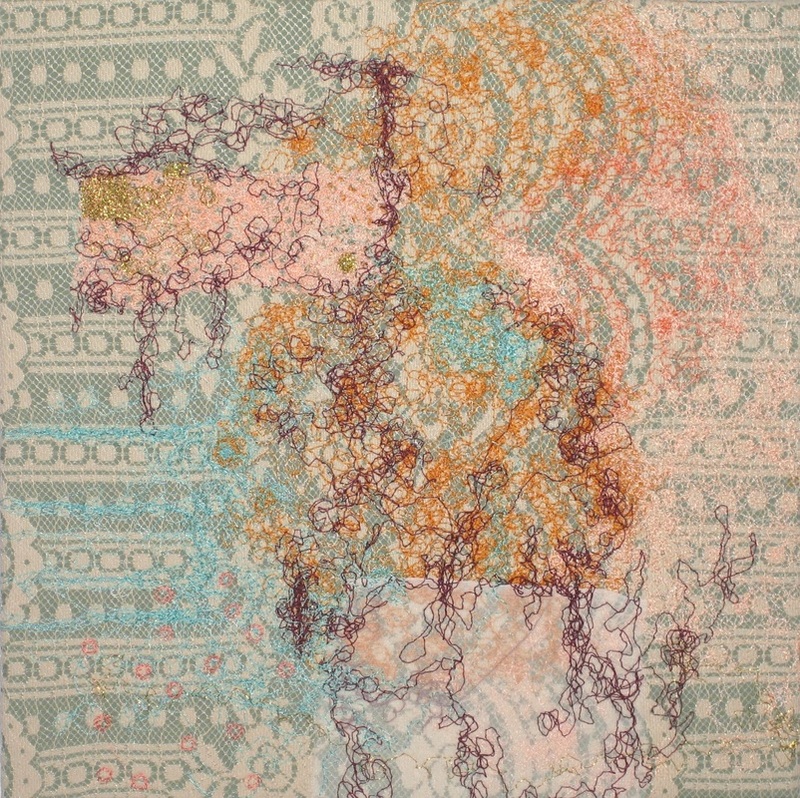 My Flag 2008 12" x 18" Batik silk, machine embroidery. Peacock Ikat 2008 24" x 10" Cotton, indigo, and peacock feathers. Two Together 2007 12" x 12" Found fabric and machine embroidery. Alone 2007 12" x 12" Found fabric and machine embroidery. 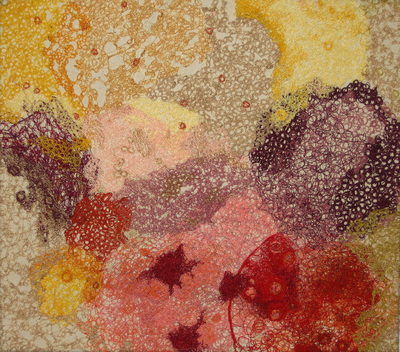 Spores 2007 24" x 30" Machine embroidery on canvas.